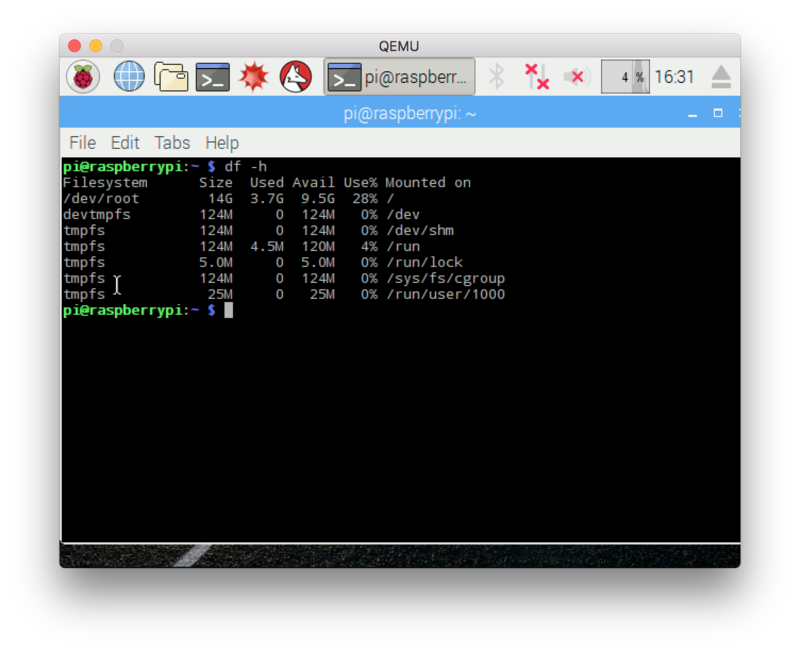 You probably never want to try, but just in case, what if you want to emulate a arm processor running a Raspbian on your machine. I really thought it was going to be a cozy walk in the park but quickly realize some things never get easy. In a single sentence, here is what we want to achieve today. Upgrade to the latest Raspbian packages. You saw that one coming and yes, it’s not that hard to instal qemu, but every plateform of course has a its favorite different way to achieve it. On windows, you can download the qemu binaries from here, or directly to the windows binaries. Well, QEMU can emulate a wide range of machine, and CPUs. If the binaries are properly installed on your system, you can quickly use the two one liners below to check what machines and cpus are available. QEMU installed, we now need a QEMU compatible kernel to boot our system. dhruvvyas90 regularly provides kernel images. Now we need a filesystem image, with the usual raspbian disk image. We’re taking an old one here, but recent ones would do it to. We’ll use qemu-system-arm to run our qemu commands. Let’s create a short cut for it. On first boot, we need to fix a few files so that the system can run properly with qemu, and so we’ll boot the kerel in an emergency mode like so we can edit those files. Let’s now boot the raspberry with a bash prompt using the qemu command below. As we have sed, (pun intended) some files present on the raspbian image, are preventing a full boot from qemu. We do some seding, to edit the three files below, and comment out the problematic loading/preloading. Now is the time for a second boot, where we can go to the full desktop version of raspbian. And .. it works ! Without booting, by mounting the filesystem contained in the img file. Yes this is also possible if you’re on linux. You can mount the img filesystems, and edit files directly on them. I found out that the easiest was probably to just use the deprecated -net nic,vlan=0 setting to the qemu command. The other settings I found here and there did not make it for me. With this, you can ping the outside world ! Nice. Well, up to now, things went smootly, but you can’t really do much with this image because the filesystem has no pretty much zero space left. First, let’s resize the base img file by using qemu-img on the host first. Then booting the raspberry in shell mode again, we can use both fdisk and resize2fs to get the root partition to be the size we want it to be. Let’s try to login via SSH. Well the SSH deamon is not running. so let’s start it first. And then we can ssh to the pi with the forwarded SSH port. And now is the time for a fresh upgrade. This takes … A LOT OF TIME …. but the ARM backend used to run the raspberry only support one core. Too bad. Now the icing on the cake, this exercice was done to actually test some NodeJS code running on ARM. Oh … nodejs is going away !!! The best way I found is to actually download the proper tar.gz and extract on your virtual arm machine. To open a new port without bridge networking setup, let’s add a new port forward to the qemu command. In this second command we now map port 3333 to 3333 on the host. And see uname information showing when accessed from the host, to the host IP and on the forwarded raspberry port.